You know I’m not prone to vociferous adoration characterized by the OMG LULZ LOVE IT WANT! noise that plagues our internet tubules, so you know that when I call this cake, “Awesome,” it’s because that’s what cake artisan Barbara Garrard damn well named it. Because “awesome” is apparently what you find at the intersection of zombies, unicorns, robots, rainbows, and piranha plants from Super Mario Bros. Via Super Punch, who knows that “bawl-some” is what you find at the intersection of rainbows and dead unicorns. 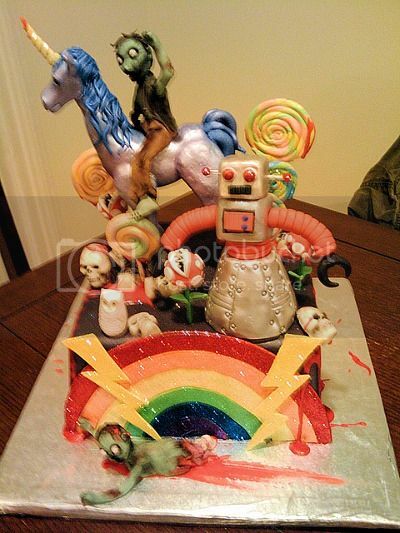 Awesome is indeed the best description of this cake. Is it wrong to want this as a wedding cake?